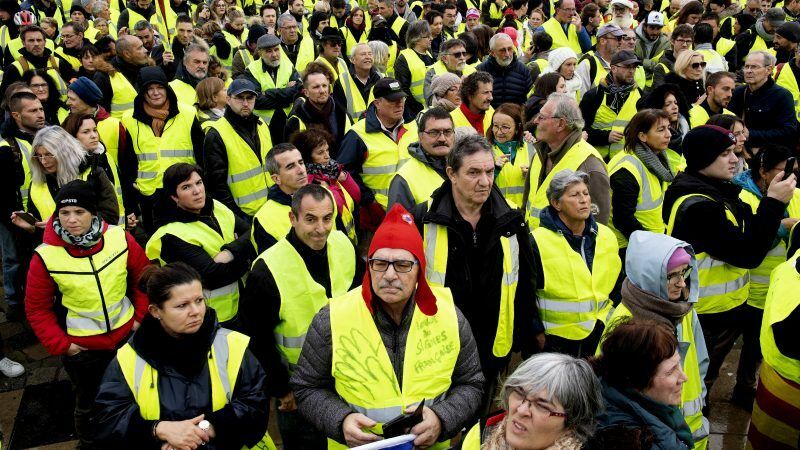 Gilets jaunes gather to protest high fuel prices. France’s prime minister on Tuesday (4 December) suspended planned increases to fuel taxes for at least six months in response to weeks of sometimes violent protests, the first major U-turn by President Emmanuel Macron’s administration in 18 months in office. The measures will cost around €2 billion, but will be offset by corresponding spending cuts, a government source said. The so-called “yellow vest” movement, which started on 17 November as a social-media protest group named for the high-visibility jackets all motorists in France carry in their cars, began with the aim of highlighting the squeeze on household spending brought about by Macron’s taxes on fuel. 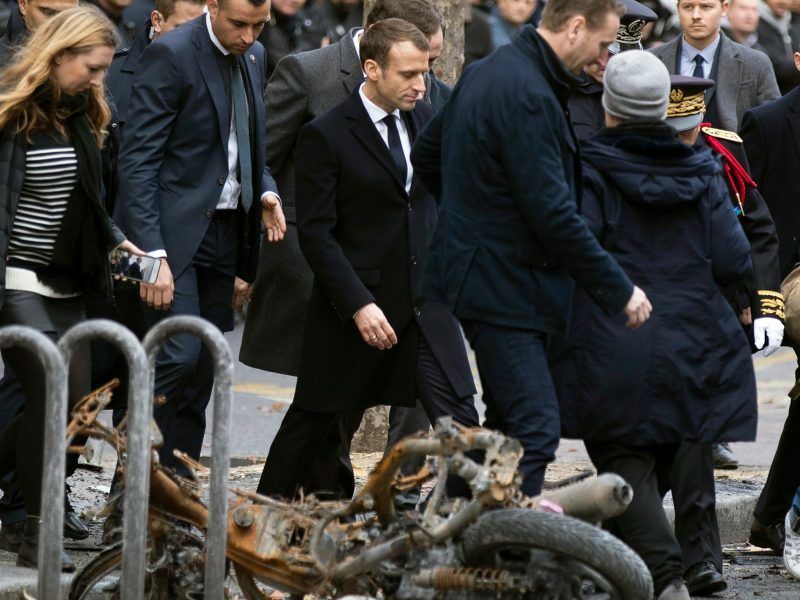 However, over the past three weeks the movement has evolved into a wider, broadbrush anti-Macron uprising, with many criticising the president for pursuing policies they say favour the rich and do nothing to help the poor. 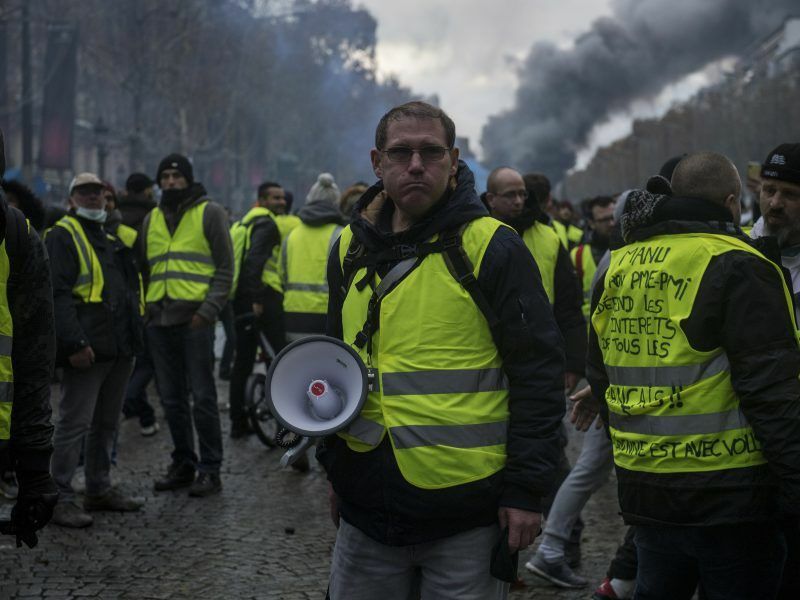 “The French don’t want crumbs, they want a baguette,” ‘yellow vest’ spokesman Benjamin Cauchy told BFM, adding that the movement wanted a cancellation of the taxes. Another one, Christophe Chalencon, was more blunt: “We’re being taken for idiots,” he told Reuters, using a stronger expletive. But the scale of the protests against his policies made it almost impossible to plough ahead. On Saturday, the Arc de Triomphe national monument was defaced and avenues off the Champs Élysées were damaged. Cars, buildings and some cafes were torched. Macron, a 40-year-old former investment banker and economy minister, came to office in mid-2017 promising to overhaul the economy, revitalise growth and draw foreign investment by making the nation a more attractive place to do business. Ahead of European Parliament elections next May, support for the far-right under Marine Le Pen and the far-left of Jean-Luc Mélenchon has been rising. Macron has cast those elections as a battle between his “progressive” ideas and what he sees as their promotion of nationalist or anti-EU agendas. 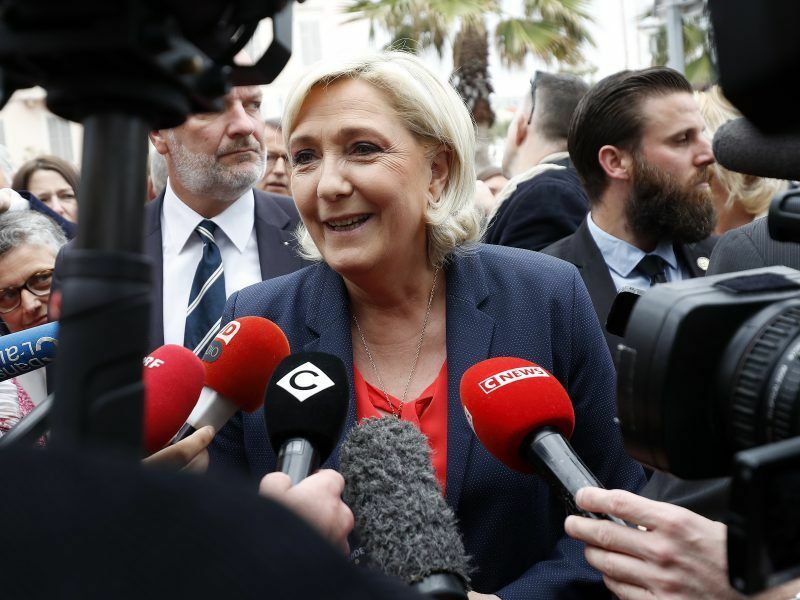 France’s far-right Rassemblement National (RN) party has overtaken President Emmanuel Macron’s centrist LREM in the latest poll of voting intentions ahead of the 2019 European Elections. I am following these protests from Asia. I am therefore giving my thoughts from outside. This U-turn should not be seen as a defeat of the administration or a shame. It is only suspended meaning it would be brought back the tax. The protests is legitimate in a democracy and the only way the public, the people, can express their desire, their positions. Democracy is not limited to elections. Between elections the government has still to listen to the people. If Deputies in the Assembly do not convey the views of the people they claim to represent then the people will go the streets to make their voices heard. It may be better for the Macron to hold a referendum on the taxation even if it may lose. This part of the democratic process. Unfortunately democracy in France is not the democracy of Switzerland. There should be more use of referenda or other means to gauge the views of the citizens before decisions of the government. Governments are supposed to serve and defend the interests, rights of the citiizens. Sovereignty comes from the people and not the state apparatus. Of course, we cannot the violence which took place. As a green person, I am supportive of the tax but here I think there is gap between the good green intention of the government and the citizens. Has there been a good explanation to the people. What kind of green education of the people? Has there been asking of why these protests? How with an increase in costs by the taxes affect the disadvantage, the poor etc.? Can the disadvantage be exempted from paying the tax? There should be attention to the wider picture, a holistic viewpoint of the issue, not just about revenue for the state or how good green intention be borne by the disadvantage and in the long term.